Methanol Injection is one of the most popular add-on systems for High Performance Engines. It works great on Supercharged, Turbocharged and Diesel engines. By injecting a mixture of methanol and water into the engine the intake air temperature is dramatically lowered. Lower IAT results in increased ignition timing, which equals more power. Besides increasing power, Methanol Injection helps to keep the internals of the engine clean. It steam cleans the valves, valve seats and piston tops. This helps to reduce carbon build up which is a common cause of detonation. The LSX Dr. recommends a 50/50 mixture of Methanol and Water. There are several inexpensive ways to make your own fluid. 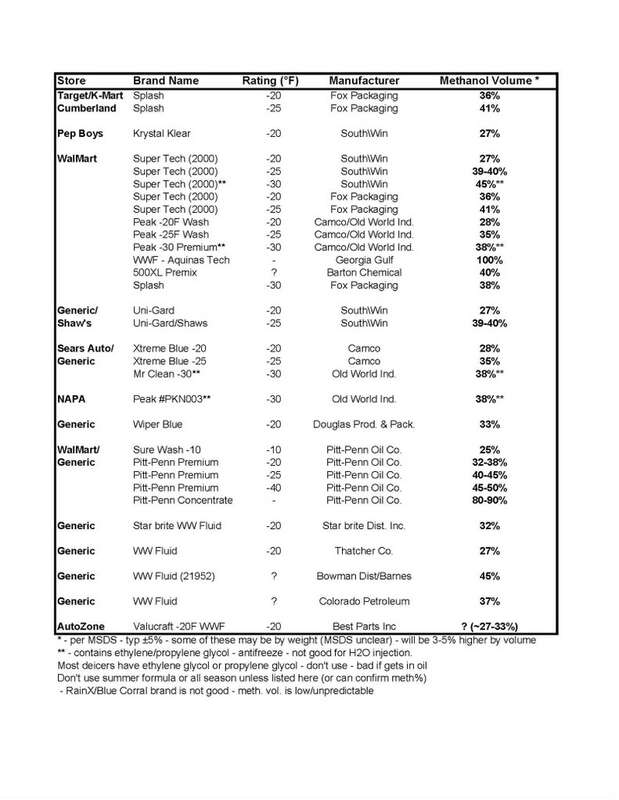 Windshield washer fluid rated at -32°F is approximately 39% Methanol. This is easily found at most auto part stores and sells for less than $2.00 a gallon. There is another product called Heet. It is sold in 12oz bottles and is 100% Methanol. By adding 2 bottles of Heet to a gallon of –32°F windshield washer fluid you will have close to a 50/50 mix of Methanol and water. This is ideal for most performance applications. When looking for Methanol Injection fluid information it is best to reference the Material Data Safety Sheet (MDSS) 67-56-1 is 100% Methanol. Never use a windshield washer fluid that contains Glycol. This will contaminate your entire injection system. Most fluids that are Blue and rated from –20°F to –32°F are safe to use. This chart below shows different brands of windshield washer fluid and its temperature rating and methanol content.